The resources included here have been categorized into the following subjects and are intended to be relevant to protected area practitioners working in the Pacific Islands. These subject-areas were refined through a Needs Assessment Survey for a Pacific Islands Protected Area Portal (PIPAP). • The SPREP virtual library or PEIN best management practices catalogue. 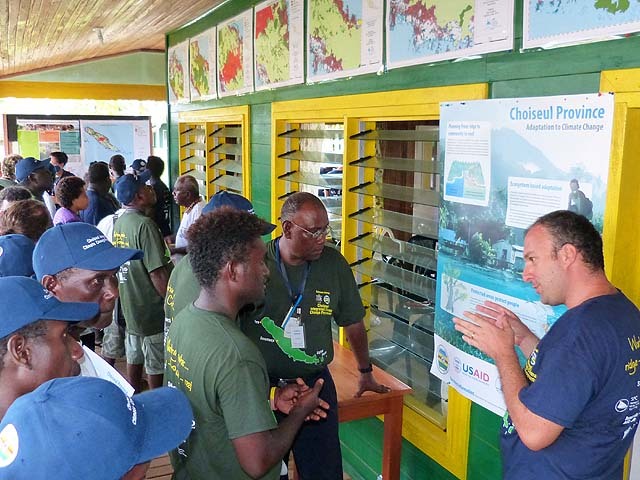 Communicating science and management within the local culture and finding innovative ways to encourage people to alter their behaviour are possibly the most important aspects of protected area creation and implementation and management. However, these are also areas that are under-resourced and often overlooked. Data analysis and interpretation are part of the evaluation aspect of adaptive management, the process for conserving, protecting, and, where appropriate, restoring lands, waters and other resources in a protected area. Adaptive management is often defined as a system of management practices based upon clearly identified outcomes, where monitoring evaluates whether management actions are achieving desired results (objectives). Adaptive management is a decision process that promotes flexible decision making that can be adjusted in the face of uncertainties as outcomes from management actions and other events become better understood through data analysis and interpretation. Adaptive management accounts for the fact that complete knowledge about fish, wildlife, plants, habitats, and the ecological processes supporting them may be lacking. The role of natural variability contributing to ecological resilience also is recognized as an important principle of adaptive management. It is not a “trial and error” process, but rather emphasizes learning while doing based upon available scientific information and best professional judgment considering site-specific biotic and abiotic factors in protected areas. Adaptive management results in effective monitoring and evaluation of a protected area management plan. For many protected area practitioners, data analysis and interpretation can be a daunting task. Often, resources and training are provided on the practical aspects of monitoring without much guidance on how to analyse and interpret the data for adaptive management. However, there is little point in collecting data unless you have plans to use that data for communication and/or adaptive management purposes and it is therefore very important to acquire some skills in this area. Below are some key resources that can be used by practitioners prior to designing monitoring programs right through to the process of adaptive management. For those who have time and are truly invested in understanding data analysis, Houk’s (2010) guidebook is highly recommended. Beneath the data analysis guidebooks are a short list of references for statistical analysis. The Pacific Islands are extremely vulnerable to the effects of a changing climate. However, incorporating climate change components into protected area planning is a relatively new field and for some practitioners, has not been considered in management planning or implementation. The resources in this section are intended to assist practitioners with monitoring, managing and adapting for climate change within a protected areas framework. For further information on climate change in the Pacific, visit the Pacific Climate Change Portal which aims to ensure that climate change‐related information and tools held by regional and national institutions in the Pacific Islands are readily accessible in a coordinated and user-friendly manner. Ecosystem-based management (EBM) is a place-based approach to natural resource use that aims to restore and protect the health, function and resilience of entire ecosystems for the benefit of all organisms. Integrate the concerns of the environment, society, the economy and our institutions. These guiding principles and some of the underlying structure of this Web site are based on the 2005 Scientific Consesnsus Statement on Marine Ecosystem-based Management and updated peer-reviewed publications. How is ecosystem-based management different? Ecosystem-based management is a long-term, integrated approach that recognizes humans are part of and have significant influences on their environments. It is a shift away from conventional management paradigms that are often jurisdictional, short term and consider humans to be independent of nature. An ecosystem-based management plan includes adaptive management strategies and trade-offs, whether between ecosystem services, management strategies or other components of the plan, that are made as explicitly as possible. Below are resources to assist practitioners with taking an ecosystem-based approach to terrestrial and marine management in the context of protected area network design and implementation. Ecosystem-based management is a realtively new field and much of the literature is recent and still emerging. Recent publications for marine protected areas (MPAs) provide guidance on creating MPA networks to achieve multiple objectives (e.g., fisheries and biodiversity). In the terrestrial field, a recent publication entitled Pacific Integrated Island Management provides excellent guidance for maximising effectiveness of integrated island management. Most protected areas in the world are affected to some degree by invasive species. The spread of plants and animals across the world has been occurring since humans began travelling across the oceans and the continents bringing with them species they like and unknowingly transporting other species. Modern globalisation has made the spread of species easier. Controlling/eradicating invasive species is a continuous aspect of protected area management, a line item in the budget. Although the challenge of invasive species can be daunting, there are success stories on Pacific Islands. Recovery: The Miracle on Palmyra atoll tells the story of rodent eradication by the application of the rodenticide, brodifacoum, and the subsequent recovery of plants and animals. Invasive species are introduced species that become destructive to the environment or human interests on Pacific Island terrestrial and marine protected areas. Invasive species can also include some native species that proliferate and become destructive following environmental changes caused by human activities. Native species are plants, animals and other organisms that occur naturally on an island or offshore in a marine environment, having either evolved there or arrived there without human intervention. What's so harmful about invasive species? Environmental harm by invasive species refers to a biologically substantial decrease in environmental quality as indicated by a variety of potential factors, including declines in native species populations or communities, degraded habitat quality or long-term habitat loss, and/or altered ecological processes. Environmental harm may be a result of direct effects of pests on native species, including preying and feeding on them; causing or vectoring diseases; preventing them from reproducing; outcompeting them for food, nutrients, light, nest sites, or other vital resources; or hybridizing with them so frequently that within a few generations, few if any truly native individuals remain. Environmental harm also can be the result of an indirect effect of pest species. For example, decreased water bird use of a wetland may result from pest plant infestations reducing the availability and/or abundance of native wetland plants that provide forage or nesting for water birds. This document lists the essential components of a comprehensive and effective invasive species management programme. It has been compiled in consultation with Pacific island countries and territories, to support them in developing their invasive species work, and to guide regional and international agencies in providing assistance to them. In general, invasive species control involves using methods based upon effectiveness, cost, and minimal ecological disruption, which considers minimum potential effects to non-target species and the protected area environment. Pesticides may be used where physical, cultural, and biological methods or combinations thereof are impractical or incapable of providing adequate control, eradication, or containment. If a pesticide will be needed, the most specific (selective) chemical available for the target species should be used unless considerations of persistence or other environmental and/or biotic hazards will preclude it. Pesticide usage may be further restricted in order to comply with any nation’s or territory’s environmental laws. Throughout the life of a protected area’s management plan, most proposed pesticide uses should be evaluated for potential effects to biological resources and environmental quality. Pesticide uses with appropriate and practical best management practices for habitat management as well as facilities maintenance should be approved for use where there likely will be only minor, temporary, and localized effects to species and environmental quality based upon non- exceedance of threshold values in chemical profiles. However, pesticides may be used in a protected area where substantial effects to species and the environment are possible (exceed threshold values) in order to protect human health and safety (e.g., mosquito-borne disease). Major invasive species initiatives are underway in the Pacific. Pay attention to information in the following networks and projects. These web sites will be greatly expanded in the near future. Pacific Invasives Battler Resource Base - This resource is to assist Pacific island invasive species practitioners in their battle against invasive species. t includes the “Guidelines for Invasive Species Management in the Pacific” which outlines a set of themes and objectives to assist in forming a comprehensive invasive species programme. It includes the Pacific Invasive Species Battler Series on common Pacific topical issues and an option to see what new resources have been added lately. You can also search for documents, case-studies, reports and other media by selecting the appropriate “Guidelines” theme or objective, or use the general search function by selecting tags related to the resources. Pollution and the growing volumes of solid and hazardous wastes are major threats to the environments and sustainable development of the Pacific islands and their protected areas. Globalisation is accelerating the transition of Pacific communities towards consumer economies, with increasing urbanisation, migration, and participation in international trade. This is resulting in an escalation in the generation of solid and liquid wastes, and these increase the risk of coastal and marine pollution. The lack of controls on imported chemicals and the lack of capacity for managing pollutants threaten to undermine the quality and health of vulnerable ecosystems on which Pacific islanders depend. Stay up to date with the latest developments in Hazardous Waste Management, Liquid Waste Management, Marine and Terrestrial Pollution, and Solid Waste Management by visiting the Waste Management and Pollution Control Division at the Secretariat of the Pacific Regional Environment Programme (SPREP). Marine Resources provides a potpouri of documents and links to information on marine species, deep sea mining, coral reefs, fisheries, seamounts, wetlands and more. It is not exhaustive and other marine related resources can be found under Partnerships and Planning.